Copyright 2004, Amanda Greavette. All Rights Reserved. Amanda Greavette, a Canadian artist based in Ontario, is well known for her paintings of birth and pregnancy. 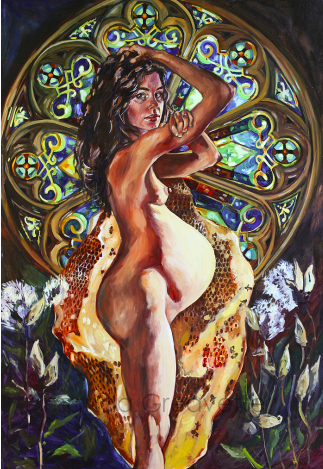 Living in the Body; Milk and Honey was one of the first of Greavette’s paintings that I came across when starting Visualizing Birth back in 2010. The large rose window behind the main figure brings a sense of spirituality, holiness, and religion to the piece. Art and religion have a long history together, although contemporary representations of pregnancy and birth are not often part of this art historical discussion. Influenced in part by her own faith, the artist named the work after a verse from scripture, explaining to me that the title refers both to the human experiences of life, including living in the flesh, and to the importance of community. Milk and Honey is the promised land, the heavenly food, and the treasures of the earth and the riches it has to offer. Greavette describes how this piece was not meant to be a religious statement but rather an outpouring of her inner musings on her experience. Her work is relatable to the many who view it, including those who identify as religious or secular. While Greavette felt particularly close to her faith during the time of her own pregnancy, a connection that in turn impacted her production of the artwork, she is welcoming and open to many interpretations of her creations. I was (also) emulating the Virgin Mary, or the goddess mother, the spiritual representation of a woman whose divine role…is creating and bringing forth life, and there is a holiness and sacredness in that. Obviously referencing the long history of this theme in art, I also wanted the woman to be real, though ideal in a way, but fully flesh too–tired in her face, gazing directly at the viewer, balancing between being the subject and being the one in power. I wanted her stance to be strong, and her be a sexual being without being overly idealized–the model was myself and I wanted a stance that communicated power and presence and not shame or vulnerability, yet while recognizing the beauty and fragility of the experience. The surrounding elements of the rose window refer to the spiritual, but the cathedral window and the milkweed and honeycomb also refer to the community. These symbolize the necessary community of support and the way in which the body, the community, and the world work together in beautiful synthesis and harmony. The bees/honey, the milkweed pods scattering seeds but providing necessary food to many insects and butterflies, these fascinating parts of the natural world leave us in wonder. Thus, (reminding us of) our obligation to assist and support each other, often to the point of self-sacrifice. And the rose window, letting light into the sanctuary of a cathedral space, beautiful light-reflecting kaleidoscopes but also symbolizing the body of the church that creates a connected community (ideally), and the design itself so very much like a mandala. Amanda Greavette lives and works in Ontario, Canada. In addition to painting and working in her community, Greavette is raising five children. She is also a La Leche League leader. To view more of Greavette’s work or to visit her Etsy shop, see her website. To read more about Amanda’s work on Visualizing Birth, see the following posts on these paintings: It’s a Human Thing (It’s a Girl?? It’s a Girl!! ), Early Morning, You’ve Got Roots.